This Body-Solid Commercial Semi-Recumbent Ab Bench review will provide an in-depth look at the machine from Body-Solid to see how it compares with other devices like it, what it’s useful for, and how it works. Is this the best machine for getting your abs into amazing shape? Read on and find out! When you first enter the gym you will be greeted by four main sections and options to begin your training. Each of these is decisively different from the rest and each will be best suited to a particular kind of person – the kinds of which will no doubt be populating the area. These three areas generally are: the free weights, the exercise mats, the resistance machines and the CV machines. CV machines are of course cardiovascular machines while the exercise mats are of course… just mats on the floor for you to use as you will. If you want to get in some serious lifting then and to really train and grow your muscles, you only really have the choice of two types of exercises – free weights or resistance machines. Resistance machines have a number of benefits – being particularly safe thanks to the way they’ll guide you through the movement and also providing the ability to guide you correctly through the movement. For abs, resistance machines make a lot of sense: they provide a convenient way to add additional weight/resistance and they also help to ensure you’re targeting the stomach precisely. With the Body-Solid Commercial Semi-Recumbent Ab Bench you can bring this experience home. First up, let’s take a look at the basics of how this machine works. Essentially, this is very similar to an ab rocker, but with added resistance to allow you to really train those abs. The closest thing to this is the ab ‘resistance machines’ that you might be familiar with in the gym. The ab resistance machine is something you sit in then in order to move weight through that same rocking motion but now with weight that you need to shift at the same time – causing more engagement in the core. This particular unit is a ‘plate loaded machine’ meaning that the resistance comes from weights you will take and add onto the bottom of the machine on pegs. This has the significant advantage of meaning that you can conveniently increase and decrease the weight as needed. But it also has the significant drawback of meaning that you need to invest in those weights in order to get that resistance. If you don’t have enough weight, then this will increase the overall cost of this investment. But the flexibility is fantastic. 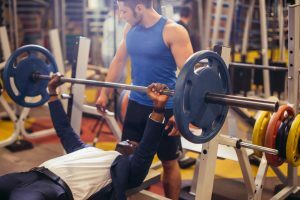 A newcomer to training can use light weights and have a relatively easy and low-stress experience. Someone who is aiming for something more challenging on the other hand can pile on more weight and really give themselves a tough workout! Also very positive is the fact that this machine is highly adjustable. That means you can alter the height of the seat and of the handles in order to make sure that the machine fits your individual size and biomechanics. We were big fans of the way that this machine felt too. It is particularly ergonomic with well positioned handles, covered in a nice soft foam. The range of motion feels upright and the frame is very sturdy and well made. Not only that, but the styling and design was attractive enough to look good in any home gym. This machine has a lot going for it. Most importantly, the fact that you can load the weights on yourself means that you can create a real challenge in terms of the weight and resistance. We loved this because it means that you can really tax the abs. One of the biggest mistakes people make when training for a six pack is to make the incorrect assumption that they don’t need much weight and they can make do with lots of sit ups. In reality though, the abs are made up of a lot of ‘slow twitch’ fiber because they are used to doing lots of sit ups. As such, if you don’t add weight to increase the challenge, they likely won’t be stimulated enough to grow. Just like any muscle, increasing strength will increase muscle size. And increasing muscle size will increase visibility. Don’t believe it? Then just try contracting (tensing) your abs. You’ll find they’re immediately more visible. Why? Because contracting makes them appear larger! The other big plus about this machine is how well made it is. It really does feel premium and it’s also comfortable and sturdy to use. The recumbent nature also means that you won’t be placing too much weight or strain on your back, making this a good choice for those with aching joints and the like. With all that in mind, it gets a very positive recommendation from us! The only downside to this system is that you will have to buy the weight plates separately to get enough resistance. For most people this won’t be a problem though: if you’re new to training then you can start with a small (and cheap) amount of weight. And if you’re a pro… well then you probably have a whole ton of weight lying around already! 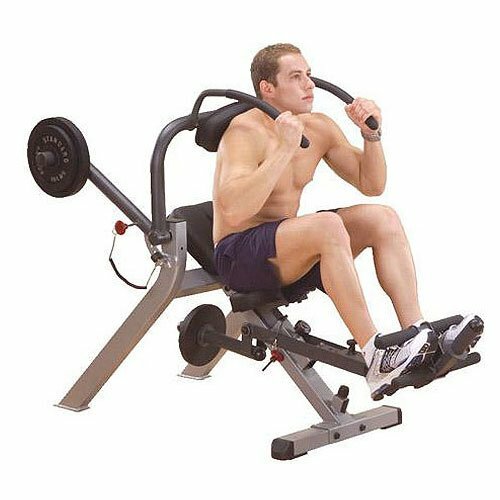 Overall, the Body-Solid Commercial Semi-Recumbent Ab Bench is a great product and comes highly recommended – especially for those interested in building big muscle. It will look great in any home gym and it provides a really tough and effective workout for those that are interested in building size, power, definition, and performance. It works best though as part of a larger training program.